Cleansing themselves in a ritualistic shower, three Foot Soldiers (a young woman named Izumi, a young man and a fat man) consider the power they are about to be given and the mission they are to undertake, though they fear the cost of failure. Entering a chamber, they are ordered by three Foot Mystics (a woman, a warrior and an old man) to drink deeply from goblets containing the Elixir of Kami Ninpo Damashii. After drinking the brew, they don the garb of the Ninpo Assassins and, after taking their weapons, vanish in a blur of speed. On the dark streets of Manhattan, the Turtles and Splinter are returning from… somewhere. As the Turtles joke around, Splinter notices a trail of sunflower seeds and is reminded of a battle he fought many years ago. Suddenly, he is besieged by the three Ninpo Assassins. Having been sent to kill the rat, they begin hammering him with punches and kicks at super speed. Hearing Splinter’s trouble, the Turtles rush to his aid. The Ninpo Assassins, however, move so quickly that they can’t even be touched. They proceed to toy with the Turtles; smacking them around with glee. From Foot HQ, the three Foot Mystics watch the battle through a monitor screen and are pleased that the Elixir has worked so well. As the Ninpo Assassins hurl the Turtles around, they accidentally burst the lid off a fire hydrant. The shower of water, moving in slow motion from their perspective, completely mesmerizes them. The Ninpo Assassins are momentarily entranced by the beauty of the falling droplets and Splinter takes the opportunity to strike. Grabbing Leo’s katana, he chops the heads off of all three Assassins. Helping his sons to their feet, he urges them to make haste back to the lair before any other villains attack. At the headquarters of the Foot Mystics (drawn suspiciously like the Flatiron Building), the Mystics bathe in a hot tub and call impatiently for their refreshments. Mummified zombies of the Ninpo Assassins (with their eyes and mouths sewn shut) come shambling in with trays of food and drink. The female Mystic muses that they used to be so fast, too. Recalling the defeat of the initiate Myzoko, and now the defeat of the Ninpo Assassins, the warrior Mystic ponders if they might have underestimated “the old rat”. The female Mystic is not concerned, as their various encounters with the rat have given them valuable information which they will use when they challenge him fact to face. 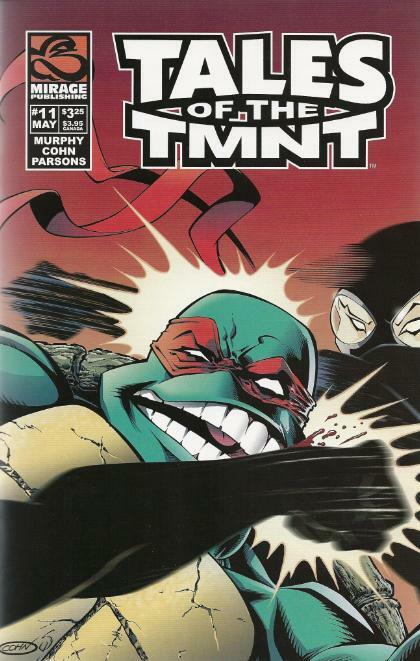 *Chronologically, I would place this story sometime after TMNT (Vol. 1) #21, when the Turtles returned to New York. *Splinter last faced the machinations of the three Foot Mystics in Tales of the TMNT (Vol. 2) #2. His statement of, “after all this time” would indicate that it has been many years since that encounter. *The three Foot Mystics will be seen in a flashback in TMNT (Vol. 3) #24, attending the creation of the worm-Shredder. Beyond that, however, these particular Foot Mystics will never be seen again. 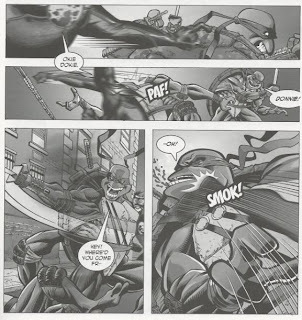 Other Foot Mystics will continue to harass the Turtles in stories such as Tales of the TMNT (Vol. 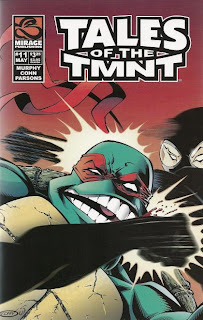 2) #43, “One’s Shadow” and Tales of the TMNT (Vol. 2) #65. *In the letters page of Tales of the TMNT (Vol. 2) #12, Murphy has this to say about the Foot Mystics storyline: "Yes, issue 11 was a sequel of sorts to issue 2 and forms the middle part of a trilogy of sorts, the third part of which will see print in about a year...The third part of the issues 2/11 trilogy is tentatively scheduled for issue 26 (but may appear earlier, depending on how earlier issues progress with their production)." *In the letters page of TMNT (Vol. 4) #25, Laird promised: "There is more to be told of the struggle between the Foot Mystics and the Turtles." *Despite these assurances from Murphy and Laird, the third chapter to the Foot Mystics trilogy was never published and the story arc remains unresolved. *The name “Kami Ninpo Damashii” is some terrible, terrible Japanese, ignoring any pretenses of proper grammar. It’s basically three nouns strung together: “Divinity”, “Ninja Arts” and “Soul”. I’m not sure exactly what Murphy was going for, there, but “Kami no Ninpo” would be the proper grammatical rendering of “Divine Ninja Arts” while the inclusion of the word for “soul” just seems redundant, as “divine” already indicates a spiritual context. The name "Ninpo Assassin" is also pretty darn redundant, as it's like calling someone "an assassin of the assassin arts". 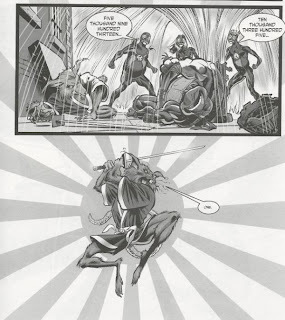 The Foot Mystic arc was one of many storylines begun in Tales of the TMNT Vol. 2 and never seen through to completion for whatever reason. While I can’t say I found the three enigmatic Mystics to be the most cerebral or thrilling villains in the series, I do so hate loose ends. The most irritating thing is that “The Quick and the Dead”, the last chapter in the story, came out in 2004 and Tales of the TMNT didn't see cancellation until 2010. Murphy had six years to tie this arc up and never bothered to. He likewise pulled a similar stunt with the Professor Obligado storyline; letting it drift unresolved when he had years to see it through. Personal delays on his part also led to the solicited “Forever War” miniseries not making it out before Laird's sale of the franchise in 2009 (and it was solicited in 2006, mind you). The way this guy refuses to finish what he starts, I’d almost think “Steve Murphy” was a pseudonym for “J. Michael Straczynski”. That annoyance aside, “The Quick and the Dead” is a story that’s more about the art than the script. 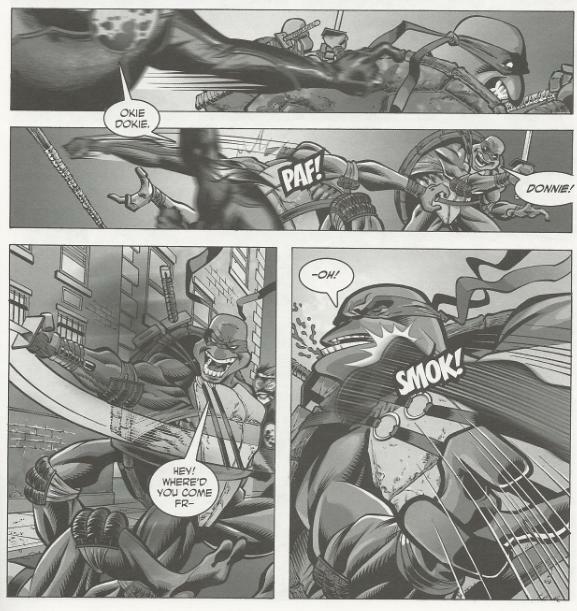 Scott Cohn was one of my favorites to work on Tales of the TMNT and he provides some great layouts and action sequences in this one. The lion’s share of this issue is, in fact, just the Turtles getting wrecked by the Ninpo Assassins, so it really is an artist’s issue. He renders those pages masterfully and the fight is more exciting than it really has any right to be (the entire thing consists of nothing but the Turtles swinging, missing, then getting hit by the Assassins, over and over). A great deal of credit should also go to Sean Parson’s inks and tones, which really bring out the best in Cohn’s pencils. He crafts a dark and moody atmosphere at the Foot HQ and along the dimly lit New York streets, but best of all, I really like how shiny he makes the catsuits of the Ninpo Assassins look. It’s the actual gleam and texture of leather, perfectly recreated. Some expert work, there. As for the Foot Mystics, I was curious about their agenda. I often wondered if they were even working in conjunction with the Foot or merely operating their own secret side project. When they first encountered Splinter through Myzoko, they had no idea he had any relation to the Foot. And here, they continue to be more interested in him than the Turtles who killed the Shredder and sent the New York branch into disarray. Their infatuation with Splinter seems to be strictly of their own personal interest and I’d have liked to have known more about that. Anyway, there’s nothing more disappointing than an intriguing storyline that never got finished. But if you can put aside the disappointing reality that you’ll never get the rest of this story, both “Seeds of Destruction” and “The Quick and the Dead” are pretty good. Sadly, they mostly just amount to a lot of set up for a confrontation we never received.